My second FO of the weekend is this skinny scarf for big sis. 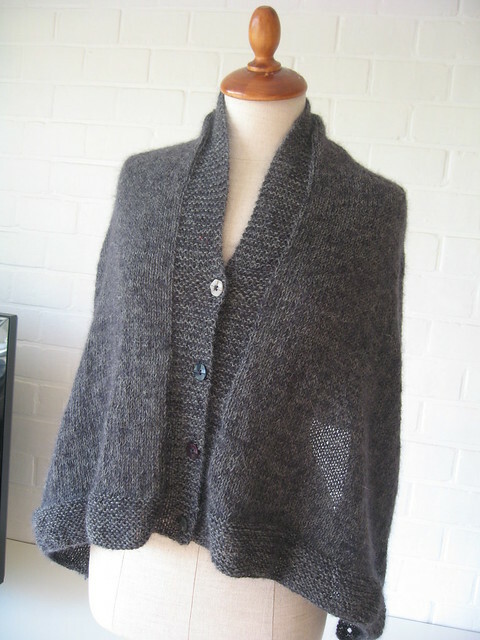 This was an informal little project to use up some leftover alpaca from the Flapper Hat I made for her last month. To get a skinny scarf, I cast on 16 stitches and knit loosely in stocking stitch, striping every second row with a double strand of Kidsilk Haze & Kidsilk Night. The gradual colour effects were achieved by changing the two colours being held at any one time - starting with two strands of magenta, then magenta + purple, then Purple + blue, then two strands of blue. Things I like about this include the thick & thin effect cause dby varied yarn weight and the natural, tubular curling-in of the sticking stitch. I also quite like the look of it with the ends tied in knots. I've been a completatron this weekend! My first little project to share is a fun knit for my friend Morticia, who loves all things skull-related. 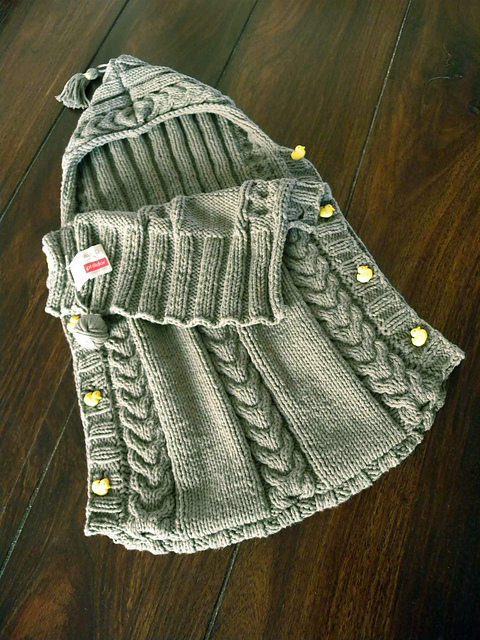 This reversible pot-holder is made from Amy Butler Belle Organic yarn. The pattern is called Deathflake and can be found as a free chart on Ravelry, for use with any sort of colour work or double-knitting. I've treated myself to two balls of Absolu angora from France. 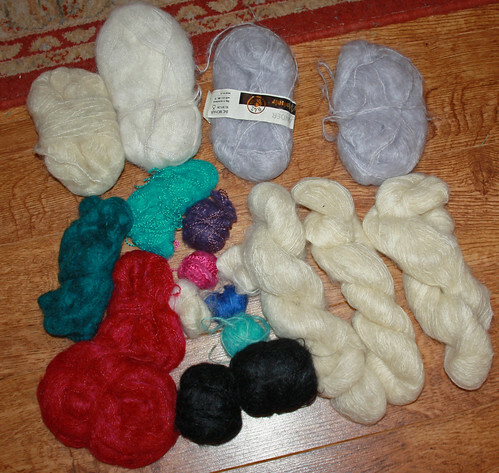 It was hopeless really... not only do I have a weakness for angora, but the idea of yarn that comes in a box was too much for me! In case any of you are curious to know more, the yarn is by Anny Blatt and if you're in the UK it can be purchased online from this French supplier. 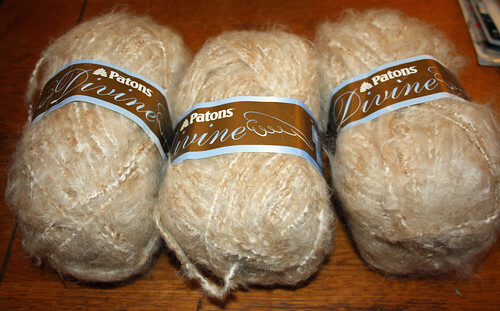 I believe a limited amount is also available in the US from Yarnmarket. At the time I had half a skein of sumptuous, pure silk DK yarn to use up and, following a search on ravelry, I found a nice little knitty pattern for a silk wedding garter, threaded with ribbon. Sometimes, when I'm clicking idly through pages and pages of patterns on ravelry in an almost trance-like state, my eyes will fall upon one that suddenly makes my pupils dilate. Recently I've begun to notice that the ones that do this for me are very often French patterns, such as this beautiful buttoned scarf/wrap/hybrid thingumy from La Droguerie. Clearly I won't be the first or last to complement the French on their sense of style, but I do think that this shines through very strongly in the world of knitting design. French patterns seem to me to to excel at simplicity and elegance of design, letting the knitting and yarn speak for themselves. 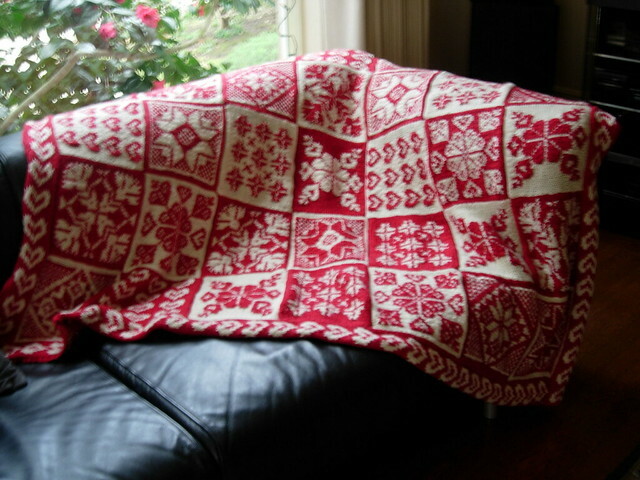 Of course, once I have faved the patterns, there is the issue of translation. Personally, I am not quite confident enough in my French skills to translate patterns to the level of accuracy and exactitude that knitting requires. But I'm delighted to report that I have discovered the Excuse Me group on Ravelry, which is populated by brilliant, bilingual people willing to translate patterns to and from a whole range of languages. Thanks to this group, I now have a translation ready for Confortable, which I hope to make very soon. 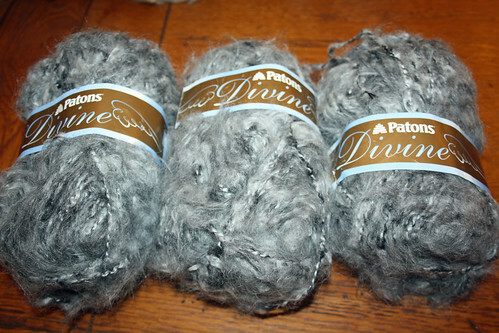 The more toys that I knit, the more I appreciate designers who go for a seamless construction. 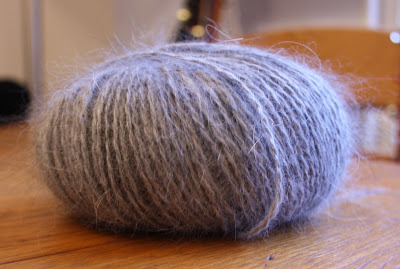 My first experience of this was making Elijah by Ysolda Teague. At the time I found it quite fiddly to pick up stitches for limbs on an already-stuffed body, but the end result was wonderfully neat and professional-looking. On the converse side, the Polly Dolly I made a year or two later was frustratingly seam-heavy, and I think it does affect the eventual look of the toy to have seams up the back of arms and legs. Today I've just finished making a cute little hippo, designed by Bobbi Padgett, for a baby boy due in April. Like Elijah, this is an excellent pattern for people who are comfortable knitting on DPNs and hate sewing up seams. For example, the arms and legs are placed on a holding needle until it is time to integrate them with the body, the yarns change-overs are simply done by picking up stitches and the head has an interesting use of short-row shaping. 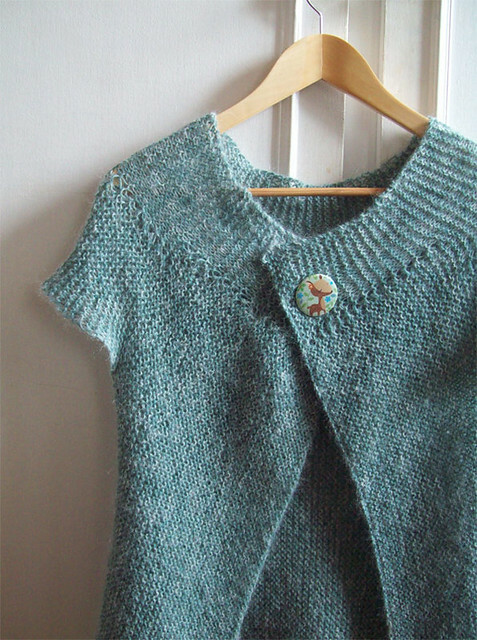 I've given a link to the pattern and more details of my yarn (and small modifications) on Ravelry, here. For now, here are some pics! I used second class postage for the UK parcels, so hopefully they will reach you before next weekend. Wow, thanks to everyone who expressed an interest in my random act of de-stash. The closing date for yarn requests has now passed and I had a lot more takers than I was expecting, with some of the yarns proving very popular indeed. So... as promised, I have resorted to pulling random names out of hats. 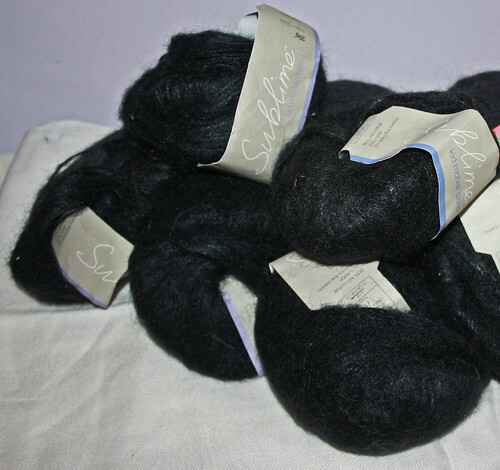 Good evening fellow crafters, would any of you interested in being on the receiving end of a yarn-related freebie? For those of you who do not already know, I am due to produce a small human being in June 2o11. And now that Christmas is over... I am starting to look at my small residence and wonder how on earth I will fit in a baby and all of its paraphernalia, amid a sea of yarn, sticks and other crafty clutter. 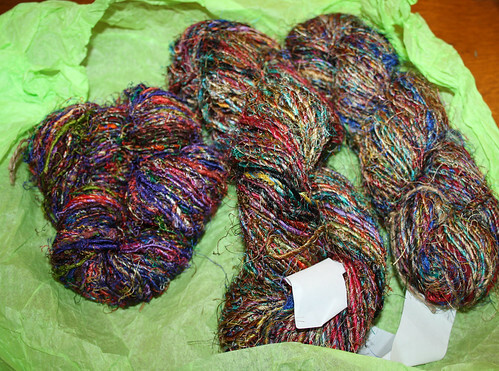 So, inspired by the trend for random acts of kindness, I've decided to de-clutter and offer some of the excess yarn out to you lovely readers on the interwebs, where I am sure it will be appreciated. If you'd like any of the yarns listed below, please leave a comment, specifying which yarn(s) you are interested in and leaving a contact email address. 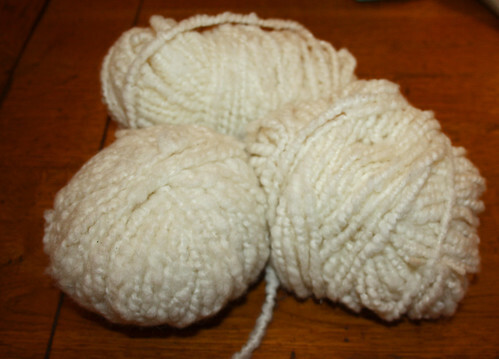 3 balls of chunky wool lopi (undyed) This was sold as unbranded yarn, so there is no ball band or Ravelry info. The vendor described it as pure wool lopi. 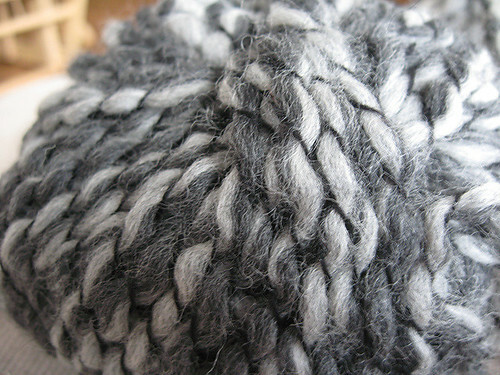 I think it would knit up very chunky and would probably felt, if desired. 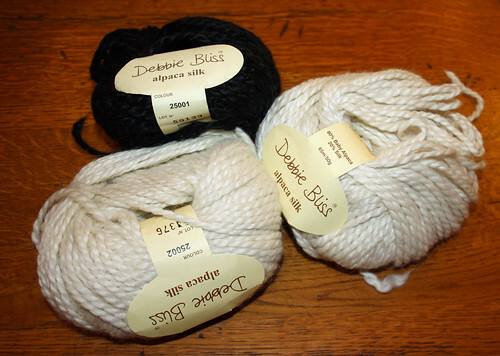 Mixed stash of mohair yarns (various colours) This mixed lot includes 3 full skeins of natural mohair in cream, a couple of vintage balls in silver/grey, some soft hand-spun in black, and a range of other oddments including some acrylics in bright colours. In honesty, I'd say a lot of these are going to be too itchy to wear against the skin but they'd be ideal for doll's clothes, knitted corsages, toys or other small projects. I hope you find something to take your fancy!